Alex Malarkey is only twelve-years-old but he already has a story most people will never experience: He has visited heaven. Alex and his father, Kevin, were involved in a horrific accident while driving home on November 14, 2004. Alex was presumed dead and a coroner was called to the scene. Alex survived, but sustained many injuries, including a severed spinal cord and traumatic injury to his brain. After two months in a coma followed by months of rehabilitation, Alex slowly learned to speak again and had incredible things to say about where he had been during his coma: of events at the accident scene and in the hospital while he was unconscious, of the angels that took him through the gates of heaven, of the unearthly music that sounded terrible to a six-year-old, and, most amazing of all…of meeting and talking to Jesus. Based upon conversations with his father, The Boy Who Came Back from Heaven is Alex’s story of what he saw and experienced in heaven. Alex had suffered an internal decapitation – his skull was completely detached from his spinal column. Skin, muscle, and ligaments were holding his head on his body but his spinal column had been wrenched completely apart. Doctors told Alex’s parents that injuries involving this extent of spinal alignment virtually always result in death. If Alex were to survive, normal brain function could not be reasonably expected. Alex would be a paraplegic, never breathe independently, swallow food, or speak. The prognosis was grim. Alex’s family and friends started a round-the-clock prayer vigil in the ICU, which spread across the country. In a matter of weeks, Alex’s most severe spinal injuries were healed without medical intervention. Doctors were stunned as they compared early X-rays with the most recent X-ray of a perfectly aligned spine. Miracles have become the theme of Alex’s story. On January 9, 2009, Alex became the first child to undergo the Christopher Reeve Surgery, which allows him to breathe without a ventilator. Today, Alex is a precocious, witty 12-year-old and avid Steelers fan, with an understanding of the unseen world far beyond his years. 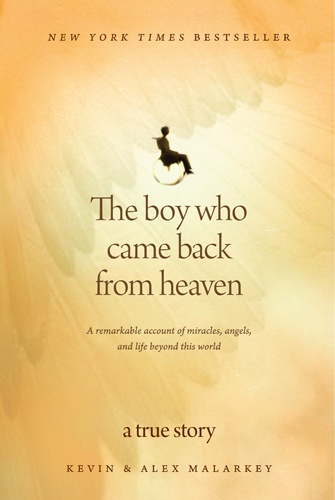 The Boy Who Came Back from Heaven is an inspirational true story that will give readers a glimpse inside the gates of Heaven and life beyond this world. Kevin Malarkey is a Christian therapist with a counseling practice near Columbus, OH. He is a graduate of the college of Wooster and Ohio State University, where he earned his graduate degree. He and his wife have four children and attend a nondenominational evangelical church. Alex Malarkey (12), is the first child in the world to have received the "Christopher Reeve surgery," allowing him to breathe without a ventilator. He can stand in a supportive frame for an hour at a time and, with the help of a special harness, can walk on a treadmill while helpers move his legs. He loves watching sports and cheering for his favorite teams, the Pittsburgh Steelers and the Ohio State Buckeyes. He believes that he will walk on his own again. contact Penny Whipps at penny@dcjacobson.com. For print and online media requests, contact KJ Raz at kj@dcjacobson.com. D.C. Jacobson & Associates is a multi-service publicity firm with over twenty years of experience working with all types of media. We collaborate with clients to create a strategic plan unique to each author’s message. Our goal is to gain name recognition and exposure in the media for our clients and their products through both traditional and new emerging media avenues. Our years of relationships with various media enables us to garner reviews and interviews for our clients using a variety of strategies and well researched, professional press material.